In the latter months of 2014, Aut Even Hospital welcomed two new Orthopaedic Surgeons, Mr Maurice Neligan and Mr Turlough O’Donnell, to what is already a strong Orthopaedic team. 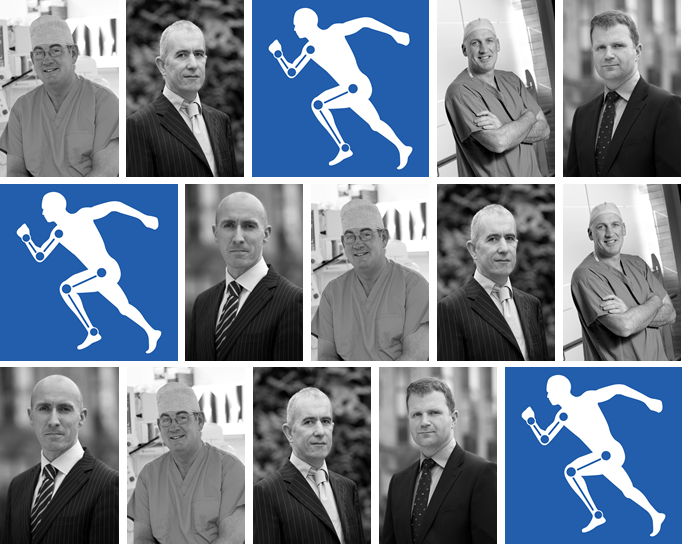 Working alongside, Mr Breandán Long, Mr Stuart Edwards and Mr Alan Laing, these Consultants canoffer patients, young and old, a full suite of orthopaedic services.Mr Maurice F Neligan, Consultant Orthopaedic Surgeon specialises in Shoulder, Knee, Hip, Sports Injuries. He was appointed to Tallaght Hospital as an Orthopaedic Consultant in 2005 and worked there until 2012. He was then appointed to Chief of Orthopaedics in Beacon Hospital. With a Specialist fellowship undertaken in in the Fowler Kennedy Sports Medicine Clinic, based in the University of Western Ontario, Mr Neligan is well positioned to extent the sports focused orthopaedic services at Aut Even and indeed, the South East. Specifically, Mr Neligan’s interests are in sports surgery of the knee and shoulder, arthroscopic surgery, knee preservation surgery, and hip and knee arthroplasty. He also has a major interest in trauma surgery in the area of hip, knee, and shoulder. His memberships include the Irish Institute of Orthopaedic Surgery, the Irish Orthopaedic Association, the American Academy of Orthopaedic Surgery, and the American Orthopaedic Society for Sports Medicine. Mr Tulough O’Donnell specialises in shoulder, knee, hip and wrist surgery. Mr O’Donnell held a higher training post in orthopaedic trauma surgery in the Adelaide and Meath Hospital, Tallaght in 2008 and also completed his orthopaedic training that year. He was awarded CCHST in 2008 and entered onto the specialist register of Trauma and Orthopaedic surgery 2008. Mr O’Donnell completed his Fellowship training in Monash University, Clayton, Melbourne, and The Epworth Hospital, Richmond, Melbourne in 2008 in upper limb surgery and limb reconstruction/deformity correction. His fellowship training in St Vincent’s Hospital, Darlinghurst, Sydney in 2009 was in major joint reconstruction of the hip and knee/minimal resection arthroplasty. His specialty clinical interests include total hip and knee replacement, partial knee replacement (unicondylar knee replacement and patellofemoral joint replacement), sports injuries of the knee, surgery of the shoulder, rotator cuff tendonopathy, shoulder instability, shoulder replacement and arthroscopic wrist surgery. As a compliment to the Orthopaedic team and as a critical support to the already established and highly respected Pain Specialist, Dr Tadgh Lynch, Dr Kathir Tamilmani continues to grow his practice at the Hospital. Dr Tamilmani is a Pain Specialist who focuses on interventional techniques for treating chronic pain and primarily sees patients who suffer from back pain and neck pain, as well as pain in major joints, abdominal and pelvic pain, facial pain and headaches.